“is this a Cane Toad? how far can cane toads spread? Toads in northern New South Wales . Northern Australian Cane Toad Site. web sites on Cane Toads. Despite the recognition that the Cane Toad has had a devastating impact on initially Queensland Biodiversity and then the NT Biodiversity the process for nomination for listing (under the Environment Protection and Biodiversity Conservation Act 1999) as a ‘Key Threatening Process’(KTP) is still not concluded. The Kimberley needs to act now to have the Cane Toad listed as a Threatening Process BEFORE impact. Despite the fact that the Cane Toad has now been a threat to Australian native animal species and Aboriginal bush foods since 1935 the federal government and state governments have done little to halt one of the worlds worst pervaders. Historically local and regional governments approach to the formulation of any strategy is to put in place programs that deal with the symptoms rather than the cause. We cannot afford to sacrifice our unique Kimberley environment. We need to be looking at measures and actions that will stop the cane toad at the WA border. The Cane Toad Bufo marinus was introduced into Australia in 1935 to control sugar cane pests in Queensland. 101 Cane Toads arrived at Edmonton in June in 1935. Breeding occurred almost immediately. Within 6 months of the introduction of the Cane Toads 60,000 young toads had been released from the 101. Cane Toads are currently spreading at a rate of 30-50 kilometre’s per year in the Northern Territory and about 5 km a year in NSW. One female Cane Toad can lay up to 20,000 to 50,000 eggs in one spawning which can occur more than once a year. Its current distribution is most of Queensland, upper NSW and the Top End of the Northern Territory. It was predicted in 1995 by scientists that the Cane Toad would eventually encompass an area of over 2 million square miles. Almost 10 years after this prediction nothing has been done to mitigate or prepare the Kimberley for the imminent Cane Toad invasion. Little research has been undertaken to investigate the impact of cane toads on invertebrate prey communities. Cane Toad eggs, tadpoles, metamorphlings and adults are highly toxic to vertebrate predators. Cane Toads tolerate a broad range of environmental and climatic conditions and appear to be able to adjust and survive in almost any habitat system, including sea water for short periods of time. Cane Toads can breed in water bodies with a wide range of environmental characteristics throughout a large range of habitats. Our native frogs by contrast are more selective in their choice of habitat so will not survive if this habitat has been destroyed. Cane Toads are likely to colonise almost every habitat type throughout the Kimberley before eventually moving further south. Cane Toads consume approximately 200 food items per night, far more prey than native frogs ingest in the same period. 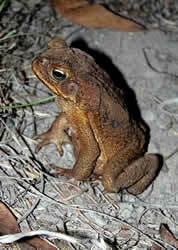 Cane Toads have the potential to cause declines in the abundance and diversity of some invertebrate taxa. The reduction of invertebrate species such as seed harvesting ants could potentially alter plant community dynamics leading to long term vegetation changes. The superior competitive ability of Cane Toad Tadpoles have a major impact on the survival rate of native tadpole species and have the capacity to compete with native species for food and shelter sites. Scientists have determined that Quolls and some reptile species are immediately impacted by Cane Toads. A sign of things to come in the Top End:” (A sign of things to come for the Kimberley). “At the last toad-busting evening in Mackay, Queensland, 70 people wearing rubber gloves caught 1039 toads in 90 minutes”. Quote from a newspaper. Confusion and panic by a community to the threat and presence of Cane Toads often results in the un-wanton killing and destruction of native species of frogs, leading to conflict and disharmony between local government representatives and the community in general. Aboriginal communities in the Kimberley will feel the impact of Cane Toads on a number of their bush tucker species. The decline in some food species will be felt almost immediately. Cane toads have been known to feed on human faeces which could results in Cane Toads harbouring human strains of Salmonella other dangerous bacteria and possibly human parasites. The contamination of water systems from the rotting carcasses of Cane Toads is a serious threat to water supplies for humans and animals. The active constituents of cane toad toxins are unique to toads and are very different to toxins found in Australian native frogs. The unique range and diversity of Australia's wildlife has attracted a growing number of overseas tourists and researchers and the foreign investment that comes with it. Inevitably declining native animal biodiversity will eventually have an economic impact Australia wide as the canetoad progressively destroy Australia's animal icons. Australia's unique wildlife has always been a major tourism drawcard for visitors from overseas. The decline and in some instances, total extinctions of some species such as the northern Quoll in the Mary River region of Kakadu National Park, will inevitably lead to a decline in the tourism dollar.